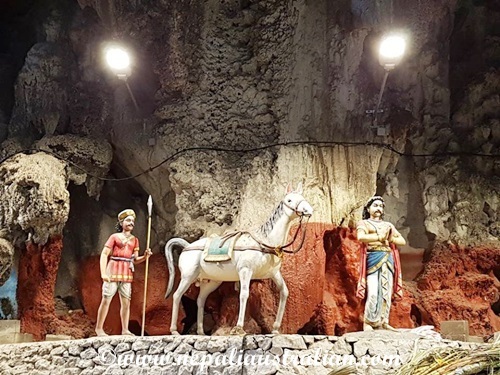 Apart from Batu Caves and Petronas tower, we managed to go to a few more attractions around KL. 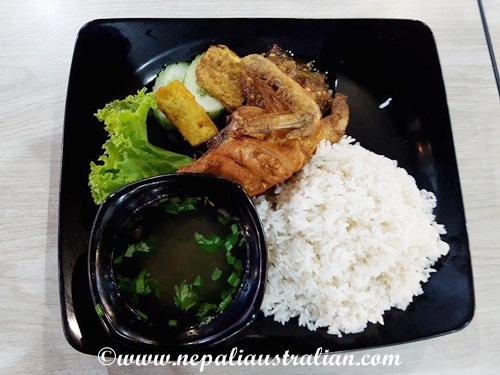 To most of the places we caught a Grab car and after visiting the attractions we also found really nice places to try Malaysian cuisine. I still can’t forget all the yummy food they serve especially the variety of fish and meats. I think vegetarians might have a bit of trouble finding options to their liking though. Due to my own lack of research, when we decided to visit King’s palace I was bit disappointed to know that you can view the palace only from the outside. 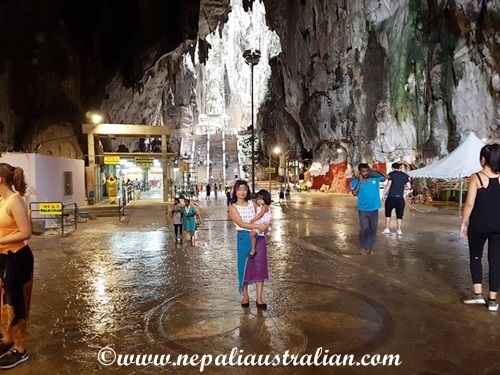 The only plus side was that it is close to other attractions like the National Museum and the National Mosque so you can do some more right after viewing the palace. 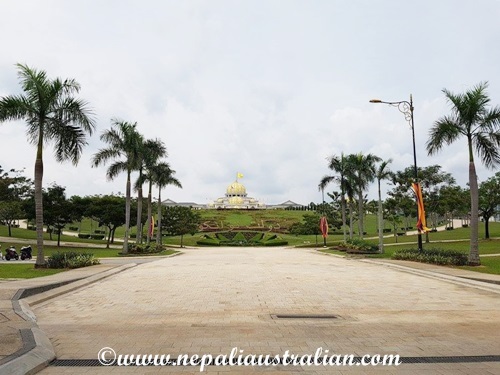 You can only see the front gate, a bit of the garden and the front of the palace. 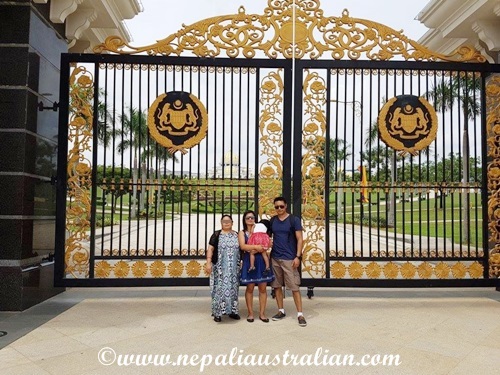 As you can’t go inside, all tourist can do is take photos in front of the gate and with the guards. As I have mentioned many time, it is really hot in KL and the poor guards are in full dress uniform. 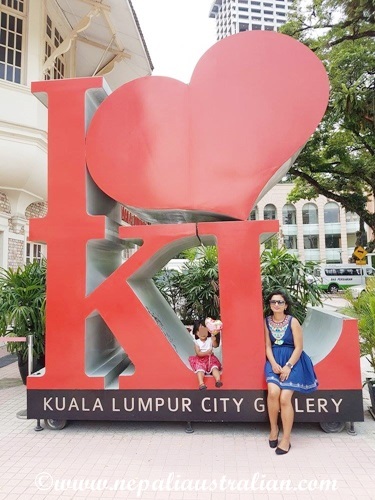 We didn’t go inside the Kulala Lumpur City Gallery as Chhori was sleepy and was in no mood for it. 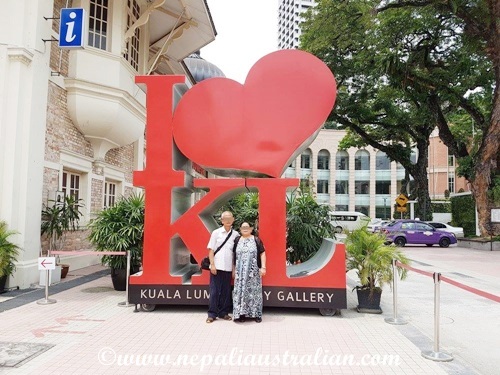 Instead we took some photos with the “I heart KL” sign and went to the nearby Merdeka Square to rest and have lunch. 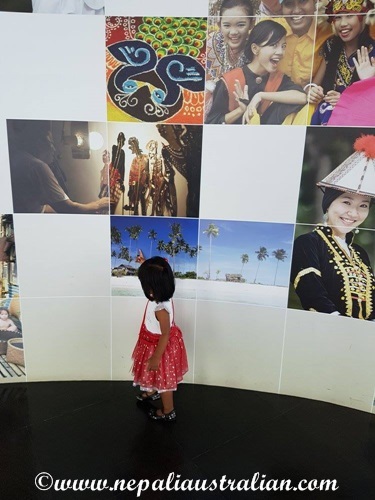 As it is so close to other attractions, it is worth going to KL city Gallery to take photos outside even if you are not planning to go inside. 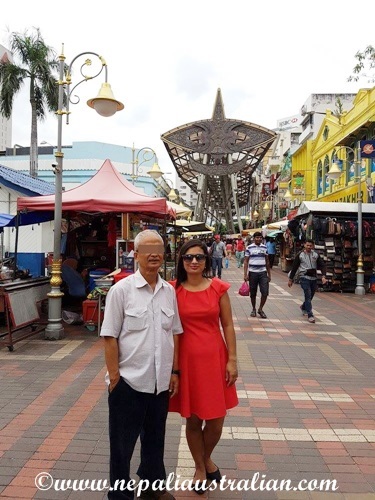 Merdeka Square is a historical ground In KL where they celebrate their Independence Day. It is surrounded by museums and historical houses. 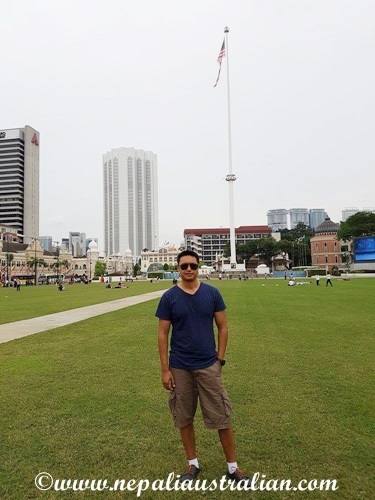 It has a 100 meter flag pole proudly flying the Malaysian flag. 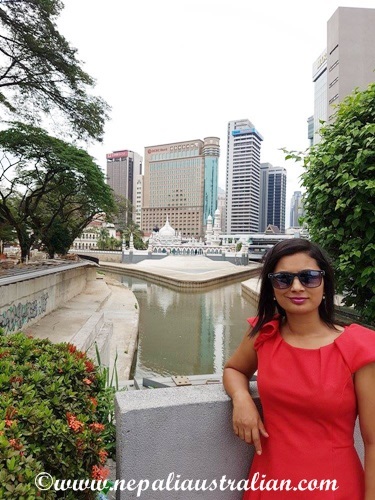 The Victoria Fountain was a gift from England to the kingdom of Kuala Lumpur in the 1800’s. It has very beauty details and looks amazing. 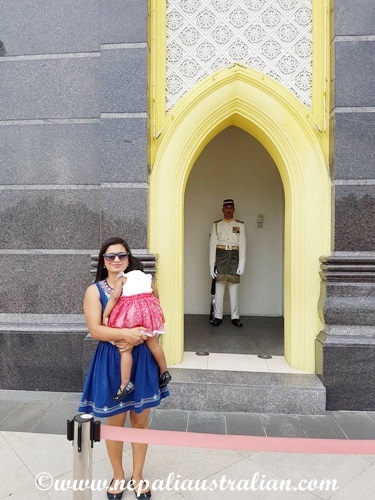 Sultan Abdul Samad Building was built in the 1800’s and is arguably the grandest display of Moghul architecture in KL with 41-meter high ‘Big Ben’ clock tower. 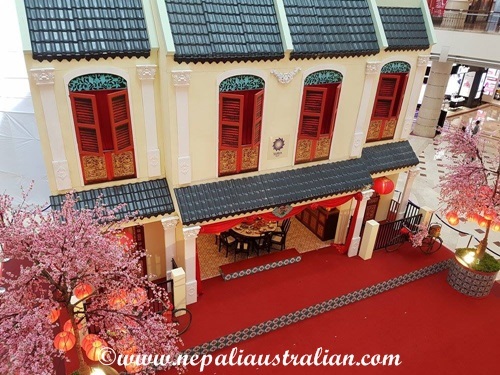 It now houses the Ministry of Information, Culture, and Communication of KL. We walk past the Masjid Jamek and it is the biggest mosque that is also said to be the first brick mosque to be built in the city. 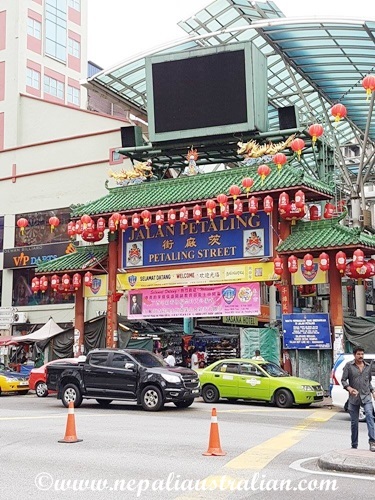 We went to Petaling Street just to browse as we didn’t want to buy anything. They sell lots of imitation branded stuff like watches, perfumes, bags for quite cheap but the quality is suspect. 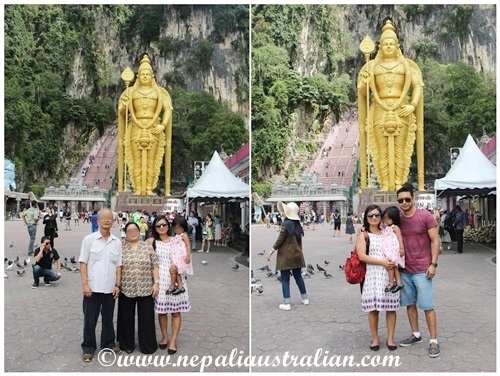 Overall we had a great time in Malaysia and I was so glad to be able to share this holiday with my parents. 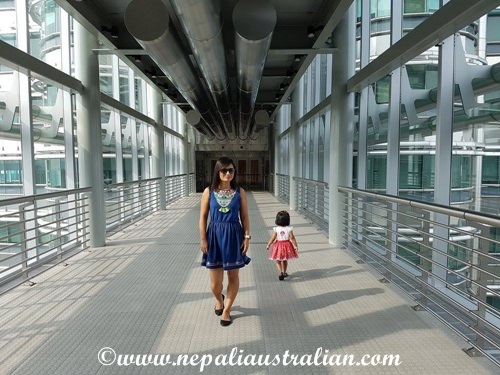 From KL, we caught a flight to Nepal to start our holiday with friends and family. I will write more about that in my next post. 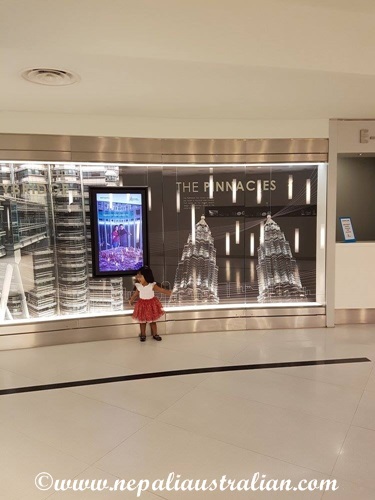 I believe KLCC Petronas Twin Towers is one of the must visit areas in Kuala Lumpur and I was excited to take the whole family there. On my last visit, we made a mistake of not buying the tickets ahead of time which meant we wasted a few hours waiting for our turn. 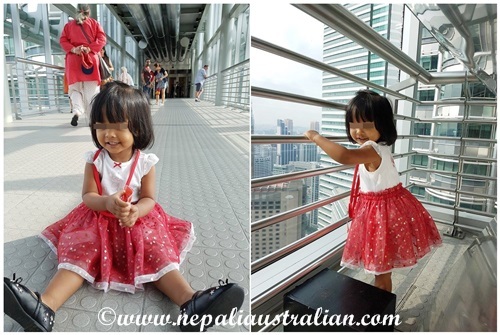 This time I bought our tickets from Sydney for our preferred day and time and we didn’t have to wait to go to the top of the tower. 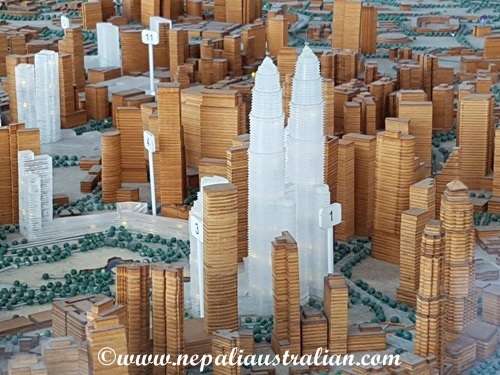 The Petronas Twin Towers were the tallest towers in the world from 1998 until 2004, when Taipei 101 in Taiwan was built. 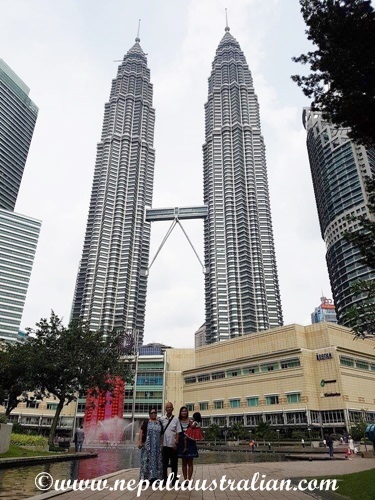 These towers are one of the main tourist attractions in Malaysia and tourists can visit organized tours to Sky Bridge and the Observation Deck. I have to admit, the visit is very organised with many staff coordinating the tours so visitors can enjoy the views and take photos. When we arrived a few minutes before our visit time, we were given lanyards to wear and wait for others in the queue to go up. 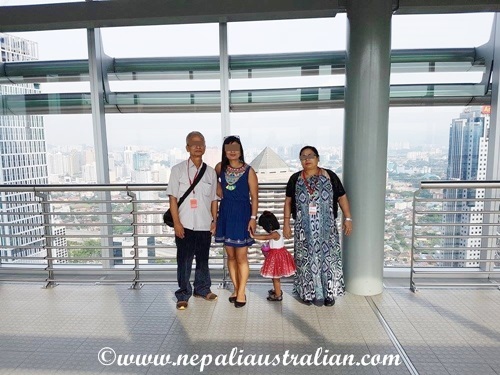 We were given brief safety instruction and we were on our way to Sky Bridger on the 41st floor which was 170 meters above the ground. 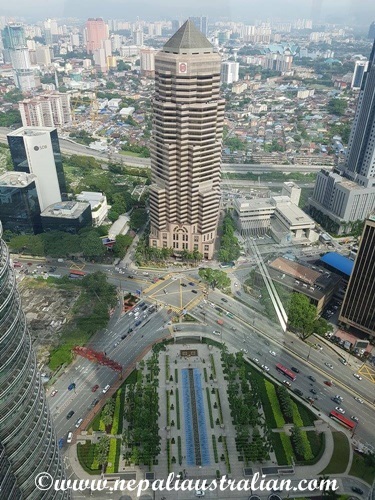 The Sky Bridge connects the two towers together and is a double-decker structure with Level 41 being for visit operations and Level 42 being for private use by office tenants. The sky-bridge is designed to not be physically attached to the two towers allowing for swaying of the buildings during high winds. We were told we had 10 minutes to enjoy the views and take our photos. 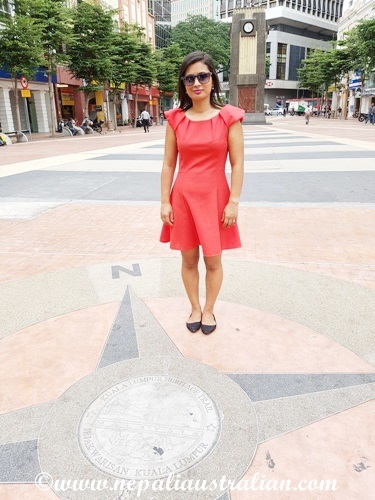 It was enough time for us to observe our surrounding and take photos. 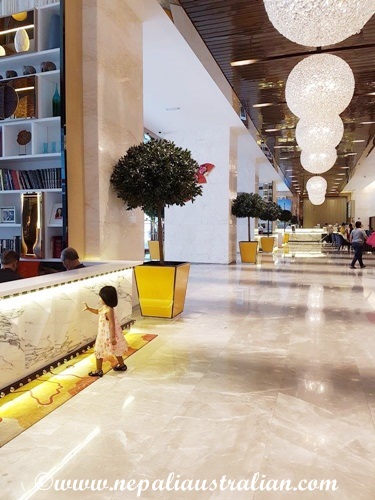 Chhori was having the time of her life running around and looking out the glass windows. 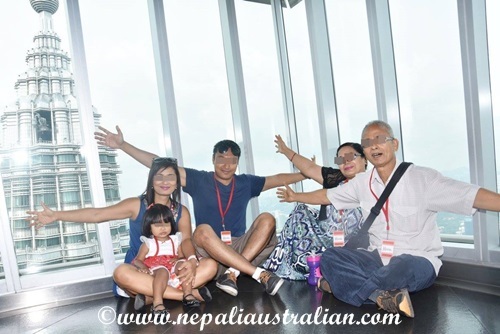 Once our time was up, we assembled again and were taken to another elevator which took us to the 86th floor to Observation Deck where we got 15 minutes. While we enjoyed the view, one of their staffs came around and took a few photos from their cameras. He was nice enough to take some from our cameras too. Chhori as usual was exploring every corner of the room. I am so glad kids can have so much fun no matter where they are. 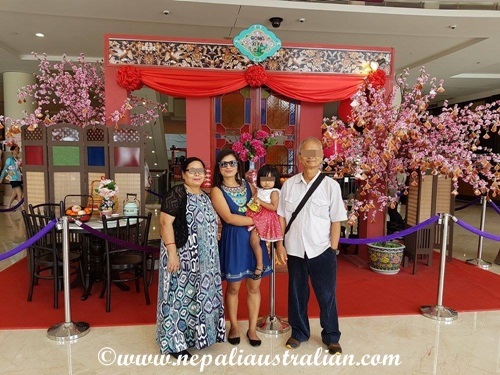 As we finished on the Observation Deck, we went back to ground floor through souvenir shop where you could buy merchandise and also buy your photographs taken earlier by the staff. 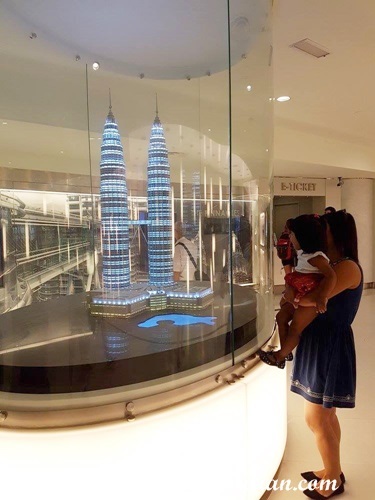 Overall we have a great time going to the Petronas Twin Towers. 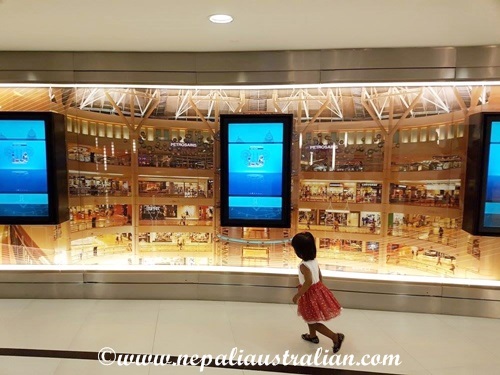 After the tower, we decided that we would do a quick shopping in the mall. 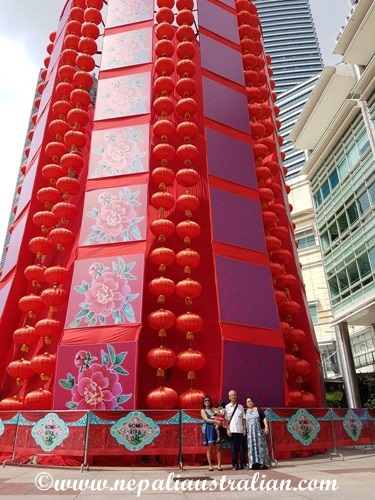 It was close to Chinese New Year so we saw lots of decorations still hanging everywhere. 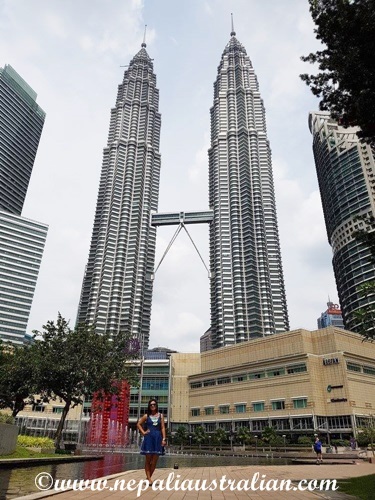 I went and bought a few shoes and went out to the KLCC Park where we managed to capture some nice photos with the towers in the background. By then it was lunch time so we went out and had our lunch. 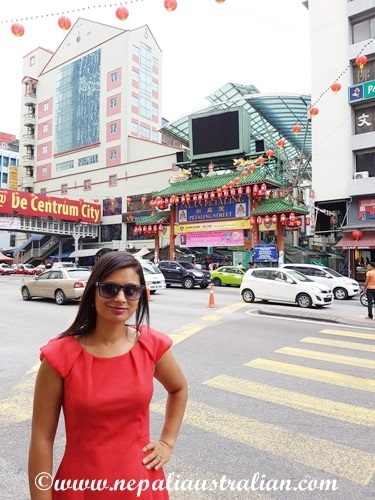 I have always loved Malaysian cuisines and it was a treat to be able to choose from so many options. AS and my parents loved the food as well. I will write more about our trip in my next post, till then take care everyone. 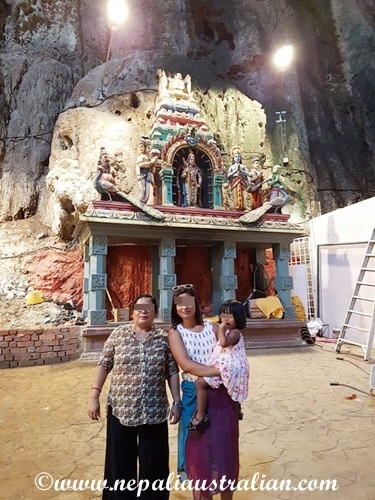 On my last visit to KL, one of the highlights was Batu Caves so it was on the top of the go to places for us. I was sure my parents and AS would like the place as well. 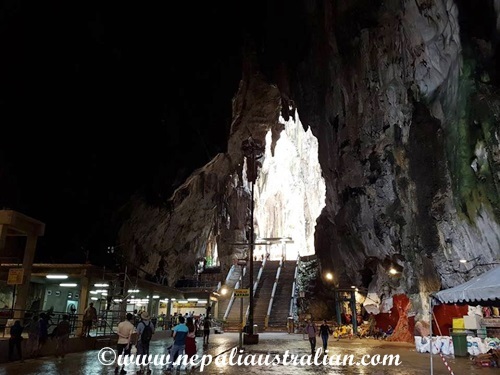 The Batu Caves is said to be 400 million years old but was only founded to be a site for Hindu worship in 1890 by K. Thamboosamy Pillai (the same founder of Sri Mahamariamman Temple in Kuala Lumpur). 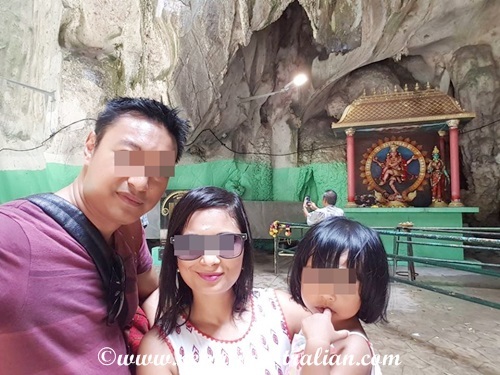 We booked a car using the Grab app and it was an easy ride, around 30 minutes from our hotel to the caves. 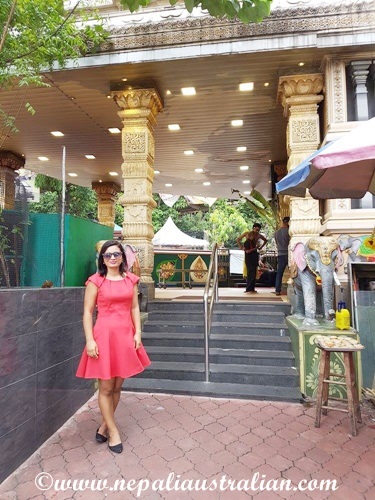 The car dropped us right outside the temple. 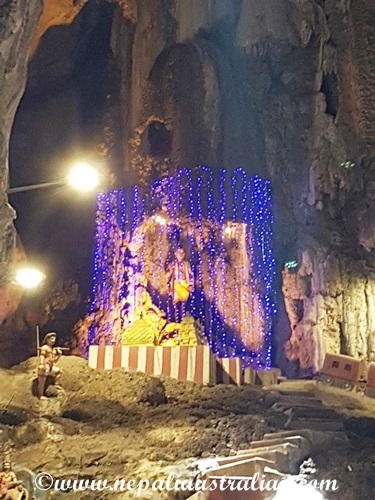 After a few minutes’ walk we could see this huge statue of Lord Murugan, god of war right outside the entrance to the steps. The statue is 140 feet tall and we looked so small in front of it. 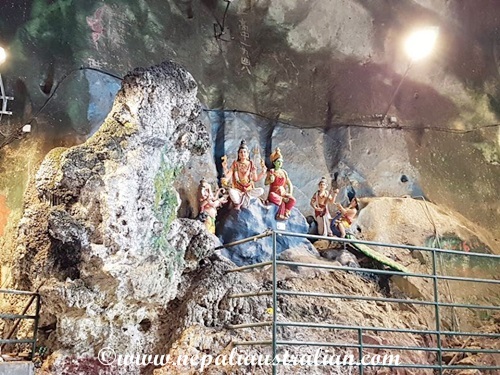 The caves are about 100 meters above the ground and the Caves temple complex consists of three main caves and a few smaller ones. 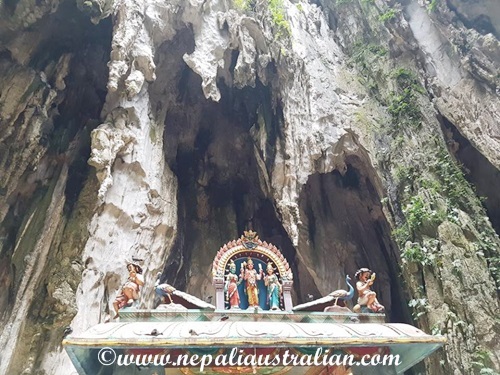 The biggest, referred to as Cathedral Cave or Temple Cave which has a very high ceiling and features ornate Hindu shrines. 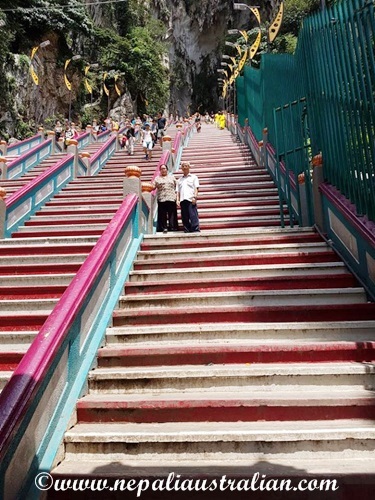 To reach it, visitors we have to climb a steep flight of 272 steps. 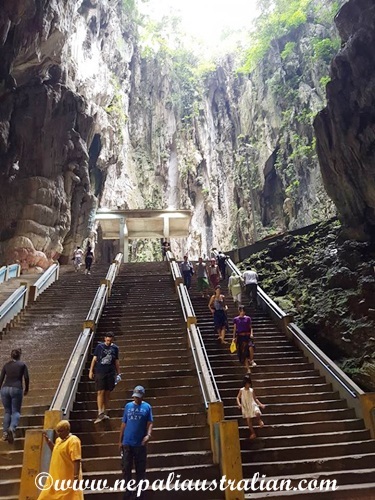 The caves and the steps area are full of monkeys, small and big. I was OK with the steps but was very scared of the monkeys as they start to fight with each other anytime. 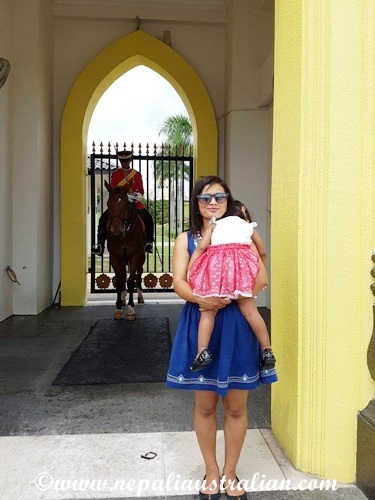 It spooked Chhori sometimes but she still enjoyed watching the monkeys up close. There were so many and they weren’t afraid of people at all, some just ran so close to us. While climbing the steps, we were resting after every 50 steps or so because it was hot and humid. 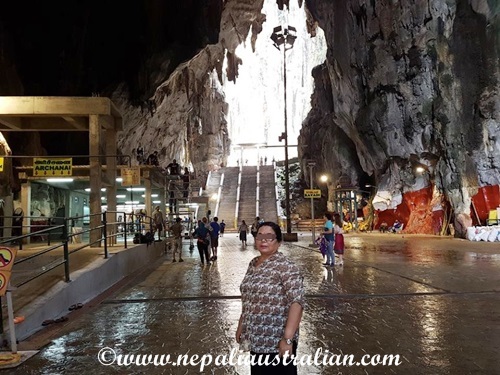 But it was all worth it when we reached the top and when we stepped inside as it was cool with water dripping from the limestones. 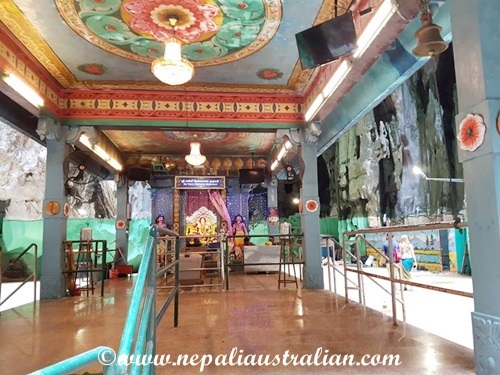 There were shrines along with a couple of temples and the main temple of Lord Murugan was further inside where we had to climb more steps, may be 20+. 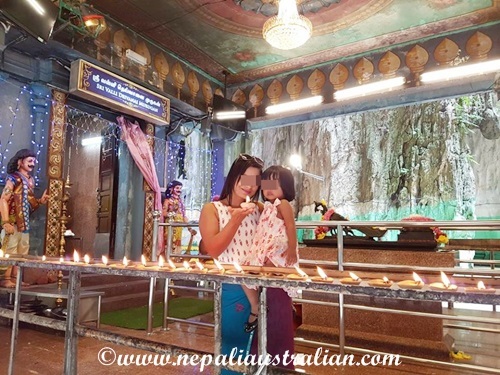 In the main temple, a priest was doing aarati when we got there and we went inside and lit an oil lamp. 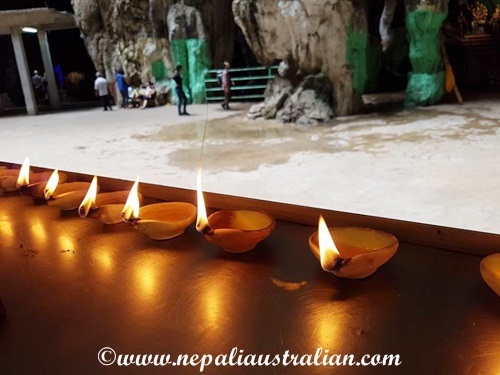 We didn’t go to any other caves but heard they were very good to explore as well. Climbing down was better but the day was very humid so we were still sweating. 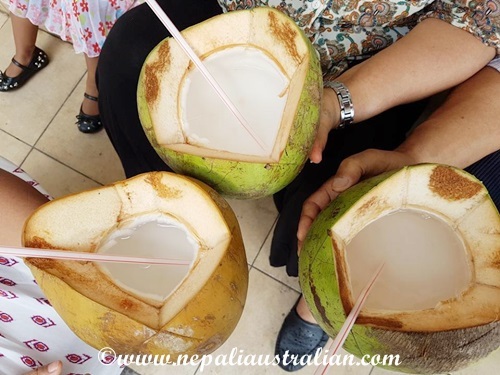 Once we reached down, we saw a vendor selling fresh coconut and we all went for it. 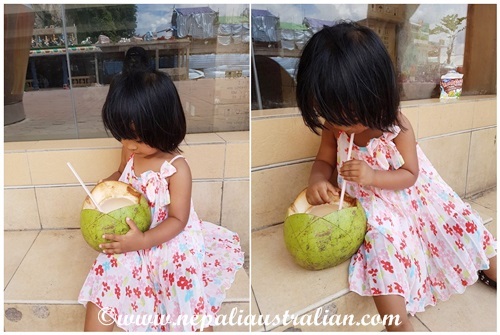 Chhori really liked it as it was the first time she got to drink fresh coconut water. We rested for a while and then we caught a car to go to our next destination. 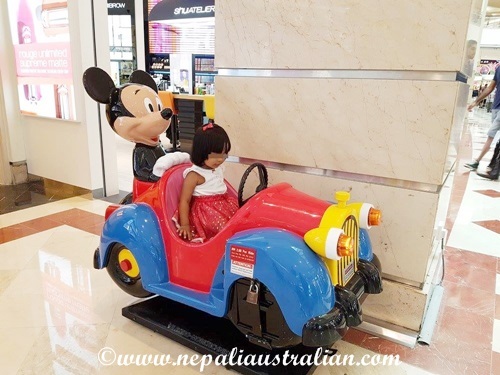 On our way to Nepal, we have stopped over in Malaysia. 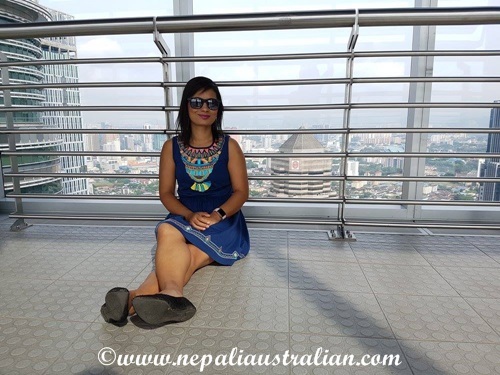 We only went to Kuala Lumpur as we had limited time. 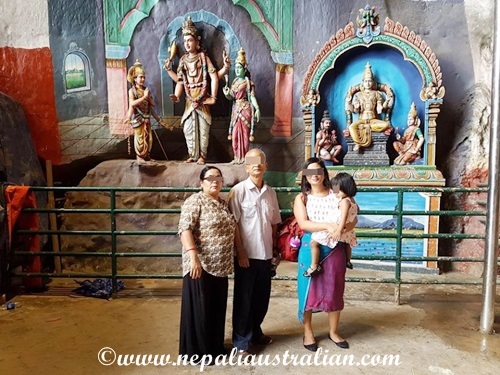 I have visited Malaysia before but it was the first time for my parents, AS and Chhori. 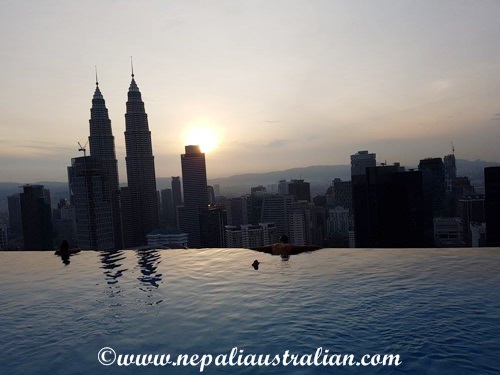 In KL, we booked a hotel called The Face Suites and I am so glad we did. Our stay at KL was made better because of this excellent apartment we were in. We booked a 2 bedroom apartment and the rooms were spacious and comfortable with a fully equipped kitchenette. The suite was superb, so tastefully decorated with everything you need and then some. 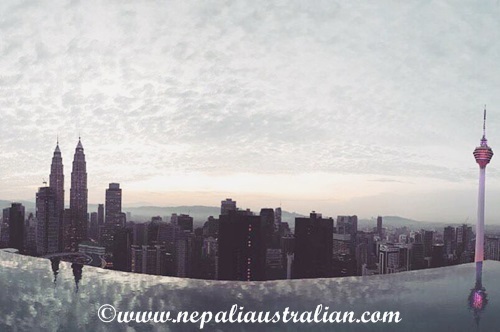 From the master bedroom, we had a great view of the Petronas Towers and the city. The bathroom was huge and clean and they had free Wi-Fi too. 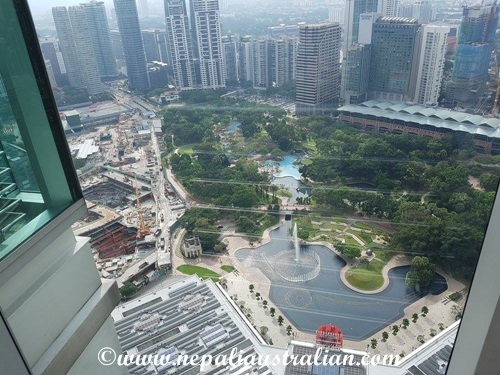 When we checked in, we were given a room on the 15th floors but it was not facing the Petronas Towers so we made a request to change the room and we were given a room facing the towers on the 43rd floor. 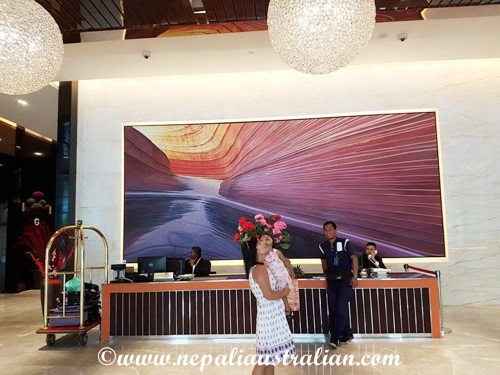 We were very happy with the room we were given and I have to admit the duty manager was really helpful. 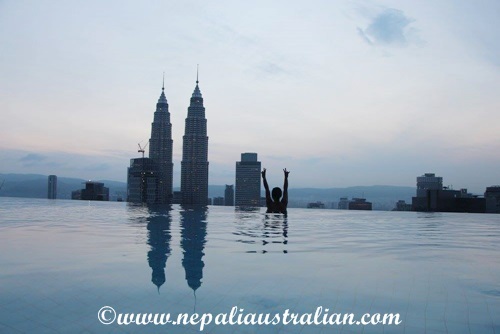 I booked this particular hotel after looking at the photo of their infinity pool on the internet and I was not disappointed at all when we got there. 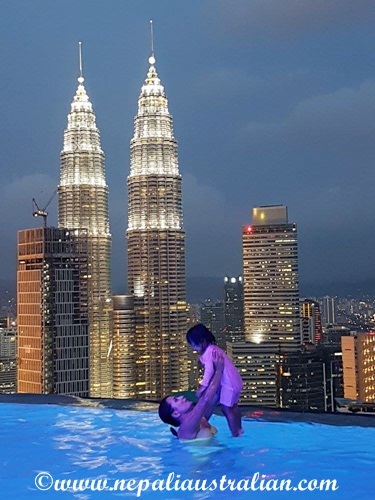 From the pool, there is a great view of the Petronas Towers and the city. The view was amazing in the morning as well as the evening with the blue lights. We spent most of our spare time at the pool, relaxing or swimming or taking photos. Chhori also had a great time as they have a kids’ pool where she could run around. For our sightseeing, we used a Grab app (similar to Uber) and it was cheap and convenient to go around. I highly recommend the service if you want to save money instead of booking tours. You do need to do a bit of homework and find out what you want to visit. 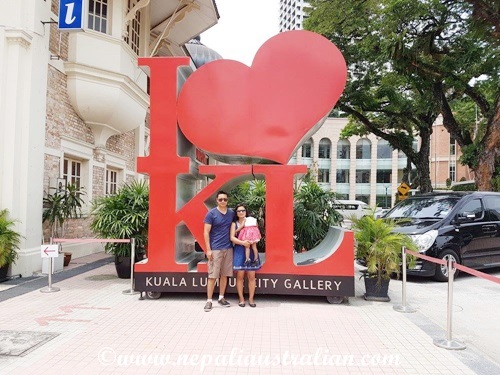 We managed to see the Petronas Twin Towers, Batu cave, King’s Place, Petaling Street, KLCC Park, Sultan Abdul Samad Building, Merdeka Square, Jamek Mosque, and the Kuala Lumpur City Gallery. I will be posting in detail in another post soon. Some of these attractions were just walking distance from each other so we could visit a few of them at the same time. 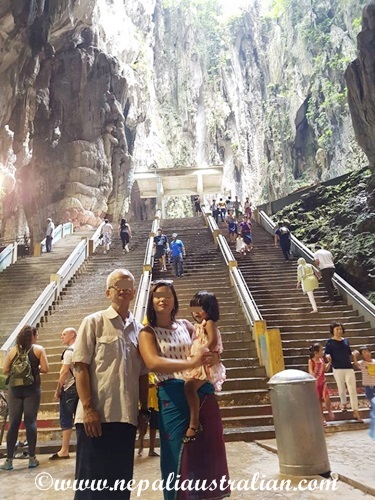 Over all we had a great time in Malaysia. 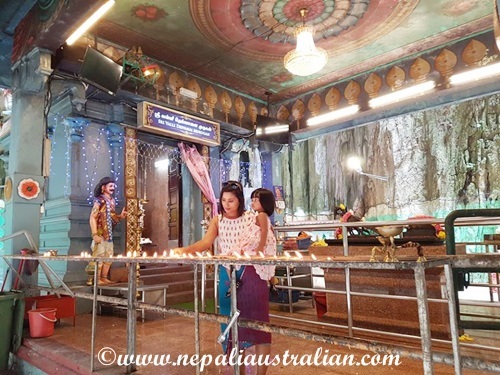 We all found the beautiful country very diverse and at every turn it was a new experience.